Halogen spotlights will be phased out from September onwards, under EU plans to crack down on inefficient light bulbs that can push up your energy bill. It might be harder to find halogen spotlights in shops from 1 September 2016, but other multi-directional halogen bulbs (such as candle or traditional-shaped bulbs) won’t be phased out until 2018. But it’s worth making the switch to more efficient, longer-lasting LED bulbs now. Our tests have shown that LED lamps are less likely to fail in the first few years of use, and they can also save you money in the long term as they cost much less to run than traditional light bulbs. Find out which LED lamps scored highest in our lab tests in our light bulb reviews. Halogen light bulbs are more expensive to run than other energy-saving bulbs. They use a similar amount of energy as traditional incandescent light bulbs and have an expected life span of less than two years. Old-style incandescent bulbs have already been phased out across Europe due to their low energy efficiency. You should still be able to pick up halogen spotlights in shops after 1 September 2016 until existing stock runs out. The wider ban on halogen light bulbs comes into force fully in 2018, as manufacturers say they need more time to develop certain features of LED bulbs, such as dimming and colour rendering. 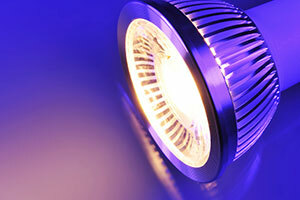 The low annual running cost of LEDs make them a good replacement for halogen bulbs. If you have six spotlights in your kitchen, fitting them out with 42-watt halogen spotlights that are as bright as a conventional 60-watt bulb will typically cost you £28.80 to run over the course of a year. But 10-watt LED lights of the same brightness will only add £6.96 to your energy bill – that’s less than a quarter of the price. For more on the best light bulb to choose for your household, see our Best Buy light bulbs. Our tests reveal that LED light bulbs have a much longer lifespan than halogen lamps, with 80% of the ones we tested lasting longer than 15,000 hours. While LED bulbs have previously been more expensive than old-style incandescent or halogen ones, they’re fast becoming more affordable. In fact, we’ve uncovered a Best Buy dimmable Best Buy GU10 spotlight for only £3.50. Our Best Buy lightbulbs go through thousands of hours of testing in our labs, and we only recommend ones that are durable, don’t degrade over time, and are as bright as they claim to be. We also see if they can stand up to heavy usage by turning them on and off 30,000 times. For advice on which light bulb is best, take a look at our Five tips for choosing the right light bulb.